Home Unlabelled TANZANIA: Cabins or cockpits? An article from genderlinks, written by Bestina Magutu. Thinking back to my younger years, I recall the question, "What do you want to be when you grow up?" Many of my peers said they wanted to be airhostesses. I do not remember any friends determined to become pilots, aircraft engineers or air traffic controllers. Years later, these positions are still considered a ‘man's job' and few women pursue these careers. Most women employed in Tanzanian aviation, work as supporting staff. According to Tanzania Civil Aviation Authority (TCAA) only 7% of Tanzanian pilots; 10% of aircraft controllers and only 2% of aircraft engineers are women. Typically, 66% of cabin crew and support staff is female. The picture is not much different in other parts of the world. According to the International Society of Women Airline Pilots, approximately 4 000 out of 130 000 airline pilots worldwide, are women. This is almost 80 years since Central Airlines in the USA hired the first American female pilot, Helen Richey. She resigned 10 months later after an all-male pilot union refused to include her. Mwanajumaa Kombo, a senior air-traffic controller at TCAA, made history becoming the first female controller in Tanzania after graduating from the Tanzania Civil Aviation Training Center (CATC) in the 1980s. "I wanted to become part of a cabin crew like my sister, but she encouraged me to go further even to become a pilot," explains Kombo. Determined to achieve her dream, Kombo resisted the stereotype that air-traffic control is a ‘male profession'. Kombo's determination has encouraged more women to pursue air traffic management as a career. Doris Bariki, an industrial engineering and management graduate from the University of Dar es Salaam believes girls and young women have the capacity to pursue any profession, so long as they believe in themselves. Bariki maintains that people must dismiss the stereotype that science and aviation is not for girls. Last month she started a 2-year pilot training course at 43 Air School in South Africa. Bariki is the only female out of the first batch of five beneficiaries of the TCAA Training Fund. 43 Air School is one of the biggest aviation training organizations in South Africa, catering for the private, general commercial, airline and military sectors. TCAA has recently signed a three-year training contact whereby cadets will undergo training at 43 Air school—Port Alfred. 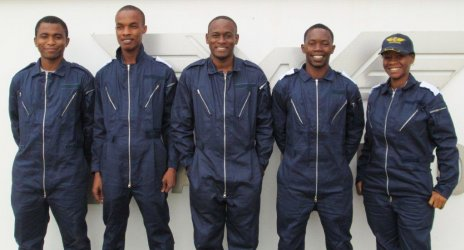 "We have been working with various Tanzanian aviation divisions over the past few years and we are certainly very proud of our Tanzanian Pilot development association," says Trevor Myburgh, Manager of Aviation Training Sales at 43 Air School. Des Lynch, Head of Flight Training at 43 Air School agrees that female candidates have to work much harder to succeed in male dominated occupations, but explains that the school is making headway toward gender balance amongst instructors and cadets. "43 Air School is proud of the fact that many of its female graduates are flying for both airlines and charter operations all over the world. Females take to the cockpit as readily as males and we count female instructors among the best that we have at our school." Magreth Kyarwenda Principal at CATC argues that the gender imbalance in aviation starts at primary and secondary level education, and girls should be encouraged to do different subjects at school. "The problem is from the root, girls do not do science subjects while aviation is a science industry," explains Kyarwenda. Chief Air Navigation Engineer at TCAA, Valentina Kayombo agrees, saying that it is not only important for girls to have role models, but parents play a vital role in encouraging their daughters to study science. "I kept on encouraging my daughters. Currently one is doing civil engineering while the other is doing medicine." With material investment in girls' education, dismantling stereotypes and encouraging girls to take up science subjects in primary, secondary and tertiary education, gender balance can be achieved in the working word. High-level women like Kombo, Bariki, Kyarwenda and Kayombo are testament to this, and are inspiring role models for young women who see themselves beyond the cabin, sitting in cockpits and air-traffic control towers. Bestina Magutu is the Public Information Officer at Tanzania Civil Aviation Authority (TCAA). She writes in her individual capacity. This article is part of the Gender Links Opinion and Commentary Service, bringing you fresh views on everyday news.